Franklin filed an appeal of Stockton's bankruptcy confirmation this week. I hope that my previous prediction that Stockton's plan would be rejected in Court will continue to be wrong. 1. It incorrectly interpreted the Best Interest of Creditors Test. 3. The plan was proposed in Bad Faith. 4. The City has not adequately disclosed payments and fees related to the case. I find the second argument most compelling, and it is a big reason why I originally thought the Court would reject the plan. Of course, I am not a lawyer. According to Judge Klein, Stockton's classification scheme does not discriminate illegally, and the appellate court may agree. Below is an excerpt on this topic from Franklin's appeal. same treatment. The Court erred by disregarding that authority. payment of retiree claims and 52% to 100% payment of other City bonds, including the wholly unsecured Pension Obligation Bonds. This legal error is likely to lead independently to reversal." On Wednesday November 19, the Business Forecasting Center is organizing a forum in Modesto to share the results of a project we have been working on for the past year with regional leaders and the general public. In addition, to Dr. Pogue and myself with Powerpoints of data on the regional economic system, there will be panel discussions with leaders from inside the region, and some guests from the Bay Area and Sacramento to discuss how the North San Joaquin Valley fits within the mega-region and how collaboration between counties can work for economic development. The half day event is free, but you must pre-register. Click here for more information and registration. Also, the Modesto Bee published a Q&A with me this morning related to the event. The Fresno Bee article linked below features an important regional environmental-economic issue that is often under the radar. The article talks about air pollution hot spots that cause the entire Valley to be out of attainment with federal standards, and how air pollution regulators are looking to focus on pollution "hot spots". The graph below, borrowed from a regional data brief from California Forward, illustrates the regional disparities. 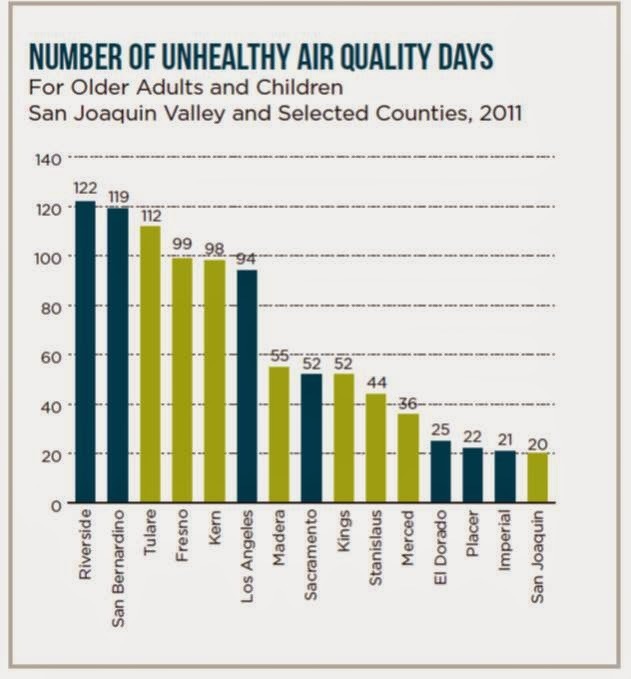 Overall, the North San Joaquin Valley (San Joaquin, Stanislaus, Merced) has less than 1/3 the number of unhealthy air days as Fresno, Tulare, and Kern, and is actually better than Sacramento, and far better than LA and the Inland Empire. The NSJV complains about the regulatory costs and poor image that comes from being associated being grouped with the South. The South Valley complains that much of their pollution isn't local, but is blown in from the North. Historically, the politics have involved the Valley’s northern tier of counties — San Joaquin, Stanislaus and Merced. Their air is cleaner than counties to the south, but they feel they need to speak up for their share of the $150 million in federal and state grants the district gets each year. The money helps replace diesel engines, fireplace inserts, gasoline-powered lawnmowers and pay for many other incentive-based cleanup programs. Thousands of old diesel engines and diesel-powered vehicles have been replaced with this kind of money. Stanislaus County Supervisor Bill O’Brien, an air district board member, defends the northern counties.